A 12-year-old schoolboy attended lessons dressed in a skirt to protest against ”discriminatory” rules which ban boys from wearing shorts. Chris Whitehead wore a girls’ knee-length skirt to classes at Impington Village College, near Cambridge, Cambs. The schoolboy is protesting against a school uniform policy which bans boys from wearing shorts during the summer months. He also addressed 1,368 pupils at morning assembly wearing the black skirt, which boys are permitted to wear due to a loophole in the policy. Chris believes that forcing boys to wear long trousers during the sizzling summer months affects concentration and their ability to learn. He said: ”In the summer girl students are allowed to wear skirts but boys are not allowed to wear shorts. ”We think that this discriminates against boys. I will march in a skirt with other boys waving banners and making a lot of noise. 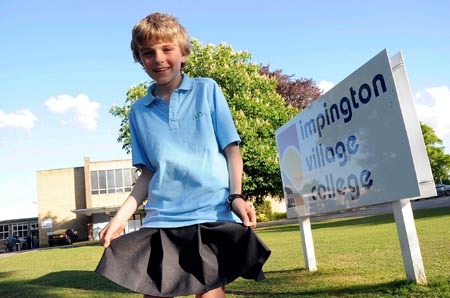 Teachers at Impington Village College imposed a ban on boys’ shorts two years ago following consultation with parents and teachers. But when aspiring politician Chris joined the school he was outraged by the policy and pledged to overturn the ban. The year 8 pupil marched to school through Impington today alongside half a dozen pupils waving banners. Chris’s mum Liz Whitehead, 50, has praised her son for standing up for ”what he believes in”. She said: ”I am delighted that Chris is taking action on what he believes in, which the school actually encourages, so he is only doing what he is taught. Headteacher Robert Campbell said the ban on shorts was imposed following consultation with students, teachers and parents in 2009. He said: ”Our uniform policy had a significant consultation and ours is typical of most schools in Cambridgeshire and the consensus was we were going to go for that. ”The issue creeps up during the summer months. ”Ultimately the boys can wear a skirt to school because it doesn’t say they can’t in the uniform policy and we would be discriminating against them if we did not allow it. ”Chris is a very bright and articulate student and we have got a very strong student council. He is one of only two year 8 pupils on it. Chris’s parents Brian Whitehead, 48, who manages and owns a publishing company, and mum Liz, 50, a secondary school maths teacher, support their son’s protest. Brian said: ”It’s a very creative and imaginative idea to make a clear point. I was worried about him getting picked on but he just shrugged his shoulders. Would You Pay $1,000 for a Pizza?